Peptids are a kind of short version of proteins, the workhorses of life. Proteins cover a wide variety of functions in the organism: They regulate the functionality of living cells and are responsible, for example, for the reproduction of cells or the transport of oxygen. This wide-ranging functionality is enabled by their unique 3-dimensional structure. Changes in this structure can dramatically alter protein function, potentially even leading to severe diseases. The 3-dimensional protein structure is not only determined by the sequence of amino acids, but also by intra-molecular interactions such as hydrogen bonding between different parts of the molecule. A current method to study such interactions in detail is to study isolated small peptides, that is chains of single amino acids, in the gas phase. However, even single amino acids and small peptides can arrange themselves into different 3-dimensional structures, so called conformers. This fact makes a detailed analysis of these important biomolecular building blocks rather complicated, since techniques such as X-ray diffraction require identical 3-dimensional structures to produce structural data at atomic resolution. Our aim therefore was to develop new experimental techniques that produce peptide samples in the gas phase with identical 3-dimensional structures,” says Nicole Teschmit from the cluster of excellence CUI (Centre for Ultrafast Imaging) at Universität Hamburg, first author of the study. 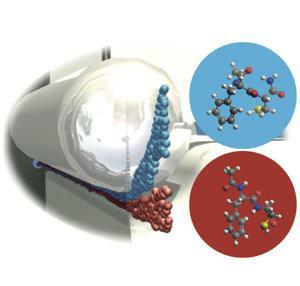 The team used laser desorption to produce very cold molecular beams of intact dipeptide molecules, which were then identified by laser spectroscopy. 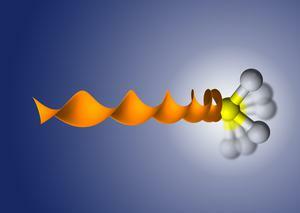 At minus 271 ºC, the different conformers no longer interconvert in such a cold molecular beam. To spatially separate the different structures, the scientists used strong electric fields that interact with the specific dipole moments of the different conformers and deflect them to different extends. With this method the scientists now succeeded in completely spatially separating the two conformers of the prototypical dipeptide Ac-Phe-Cys-NH2 and producing pure samples of either conformer in the gas phase.